Happy HBW! Today's post is about the first brew on my new brewing system. This has been a long time in the making. I didn't know what exactly I wanted to start with but I knew it would be Saison. Now that my system is complete I plan on brewing a lot more sour beers since I can get them brewed and split multiple batches. 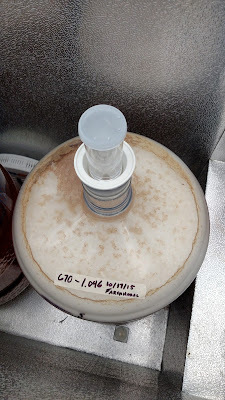 I'll also be able to test a lot more yeast strains that I've been wanting to and do the big Saison yeast experiment. The single tier brew system I've built took a long time. I knew I wanted to start building it about two years ago. I started getting things for it then and just hanging on to everything until I got where I wanted to get the big pieces like the controller and the kettles. I went back and forth on the size of the kettles but ultimately ended up going with 15 gallon kettles from Bru Gear. The experience with them could be a complete post by itself but I'll just say, the kettles are great. I would change a few things on them if I could but they work great. I also picked up a PID controller from eBrewing Supply and those guys there are fantastic. All my other components pretty much came from Bobby at www.brewhardware.com. I love the cam-lock system and everything is always delivered fast. Now on to the brew day! Below is the simple recipe I decided to use for Batch 1. 2oz of low AA Strisslespalt for bittering and a late addition of Equinox to give it something extra. I've been wanting to use this hop for a while. Simple malt base of 90% Pilsen and 10% Torrified Wheat. Fermentation will be carried out by the White Labs WLP670 American Farmhouse Blend. Notes:  No starter for the WLP670. Being the first brew day I did expect to have some complications or issues through the process. The were minor, but worth noting. First the mash temperature was managed much easier with the HERMS coil than I expected. When I ran just water through the system to test it, there was about a 6-8 degree difference between the two kettles. When the mash tun was full of grain, the difference was only 1-2 degrees. This is good but during this brew day my temperature evened out to 154F for the majority of the mash. In the end I'm sure it won't matter. There will just be a few more longer chains for the brettanomyces to chew on. I still feel the beer will dry out appropriately. Second issue was the plate chiller. I fitted each of the openings on the hose side with some quick disconnects I use around my house and for the wort side I added the cam-lock connections with a ball valve on the out. The cam-locks worked great but I guess I didn't get the quick disconnects tight enough. REALLY hot water sprayed everywhere from the out. I was able to kill the flow and get it fixed but just as a PSA to others out there... Make sure everything is tightened very well! In the end I had the wort cooled to 75F and pitched the vial of WL670. Next time I need to do a much better job of maintaining the flow if I want it to get any cooler. I used a bag of ice and pre-chiller to get the hose water cold. I feel like I can get it down in the high 60s no problem next time. During the brew day the pumps worked great, temperatures were accurate and everything was controlled really well. I'm pretty happy with how Batch 1 turned out. The starting gravity was just a bit off at 1.046 but that's very acceptable for my first brew being that my target was 1.047. I'm also excited that now I'll be able to keep a record of each batch. I wish I had done that with all my beers from the beginning but... oh well. I can now! Unfortunately, I don't have a ton of photos from the brew day. I was really focused on making sure everything went well and everything was safe. I do have a new camera that I'll be using to video some brew days and take better pictures of everything. I do have a parting shot (or video) of the vigorous boil. I'll leave you with that. Follow me on Twitter to know when I'm brewing and watch when I stream on Periscope! 10-18-15: Full krausen and fermenting away at 9AM the next morning. 10-25-15: Moved from fermentation freezer to room temp in kitchen on concrete floor. Ambient temp is around 70-72F. 2-20-16: Gravity is 1.000 and beer has developed a pellicle after taking the sample a few days ago. Definitely ready to bottle. 3-17-16: I've been busy with other projects so I just now dry hopped this beer with 1oz of Equinox. I will bottle next week. Tasting notes still to come but here is a bit from Dan Pixley in the Saison group on Facebook. Tasting notes soon! I like them to be in a bottle at least a month for good carbonation. I should have the tasting notes up soon though!